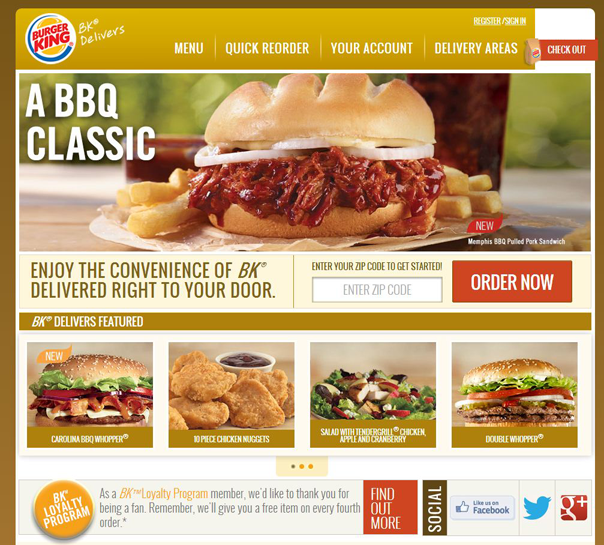 Forget content – taste is king for BURGER KING’s newly expanded BK Delivers program, which allows consumers who live or work in certain delivery zones to have Burger King food delivered to them (with a $10 minimum order). From a business side, BK Delivers’ technology, mobile and loyalty initiatives are fueling the program’s growth (now in more than 10 cities) and relevance in the digital age. 1. BK Delivers gives guests a new way to enjoy their favorite BURGER KING food while creating a new sales channel for the brand. It also gives guests the chance to order our great tasting products over more traditional delivery options like pizza. 2. BK Delivers provides a great opportunity to view and explore the menu in greater detail, without feeling the time pressures one might do while waiting in line at the counter. There is a chance to see a variety of options they might not have considered; such as lower calorie options they didn't realize were available. Not to mention they can customize their choices and have those selections remembered so it is a one-click order the next time they place an order with BK Delivers. 3. We do have a BK Delivers Loyalty Program that encourages greater frequency by offering a free sandwich to our loyal guests on every fourth delivery order. After redemption, the cycle starts again so that guests can keep receiving free sandwiches on every fourth order placed through BKDelivers.com. The previously mentioned one-touch ordering helps to encourage repeat orders/conversions. “Using ‘remember me’ technology, the system automatically saves your past orders and whatever customizations you made to your orders,” said Pusta. “Today, people are looking to have things exactly as they desire, whether it is for health or taste. However, sometimes people are reluctant to fully customize when others are waiting in line at the counter; different that on a call or online. A large component of BK Delivers is reaching consumers on whichever device they choose to access the program with: mobile, online or call center. BURGER KING, founded in 1954, is the second largest fast food hamburger chain in the world, and its technology, mobile and loyalty initiatives are ones to watch.